Conor McGrandles was philosophical after MK Dons' 2-0 defeat to Lincoln City all but ended their chance of the League 2 title. With the Imps now 11 points clear with five games to go, Lincoln are almost certainly destined for the crown and promotion to League 1. In an end-to-end clash against the league's top two, there was little time for either side to relax, with both sides going all out. 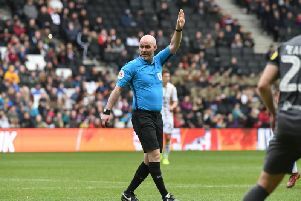 But after the thriller at Stadium MK, which saw Dons slip to third on goal difference, McGrandles said: "It happens throughout the season. There have been games we haven't played well and we've won, teams will feel like we do right now. We've had a few ourselves too. We've been here before, it's only one game, we've got five games to get 15 points. "There will be times we think we've done it and teams have blown it. But if we win all our games, we're done." Lincoln took the lead from the penalty spot in the first half through John Akinde before Bruno Andrade netted in second half stoppage time to wrap it up. "Up until they scored, we dominated," said McGrandles. "We had more territory, possession but the penalty gave them something to hold on to. They're effective, they're strong. On another day, we'd have easily won that game. "They're well drilled. But I always thought we were going to get a goal and win it. We're still in the top three, we have a massive game next week, we've got to dust ourselves and go for that now."